Two of Britain’s most celebrated novelists, Maggie Gee and Fanny Blake will explore the inspiration behind their writing. 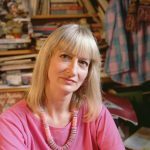 Maggie Gee has published fifteen books and is Professor of Creative Writing at Bath Spa University. Her latest book, a black comedy-thriller whose six foot one inch heroine, teacher Monica, rampages through a country where terrorism has become routine. Fanny Blake was a publisher for many years, now a writer, her latest novel, Italian Summer, is a gripping novel about family secrets.